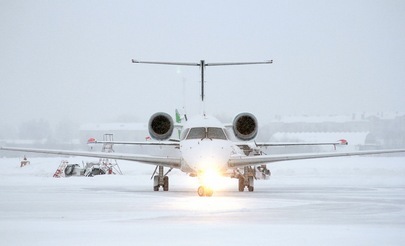 On January 21, yet another Embraer ERJ145LR of Komiaviatrans Airlines landed in Syktyvkar Airport in northern Russia’s Komi Republic. As a result, the airline’s fleet of this type of aircraft has increased to five units. According to the carrier’s general director Alexander Ponomarev, the new aircraft will be put into operation on January 25. Komiaviatrans receives the 50-seat ERJ145LR jets under a financial lease through an agreement with Gaztechleasing company. Under the contract, the Gaztechleasing leases out six ERJ145LRs to the carrier. In late December, Alexander Ponomarev announced that Komiaviatrans planned to receive the final aircraft in 2016 and to include it in its fleet for the summer schedule, when the number of flights would be at its peak. The general director also said that the fourth and fifth ERJ145LRs would be used mainly for international routes. An ERJ145LR aircraft carried out its first regular-service flight for Komiaviatrans on January 24, 2015. Development of a destination network and of the fleet has enabled the Komi Republic airline to enhance its business performance. According to the latest data of the Federal Air Transport Agency, from January through November 2015, Komiaviatrans carried 136,000 passengers (ranked 34th in Russia’s air transport industry). This is a 340% increase over the amount of passengers carried during the same period in 2014. In addition to ERJ145LRs, Komiaviatrans operates four L-410UVP-E20 turboprops on its scheduled routes.